The Caranzalem beach is situated at about 4 kms from Panjim in between Miramar and Caranzalem. The beach is 3.5 km long and has stretches of white sand and clear water. The beach is also considered safe for swimming as it has an undercurrent free shore. 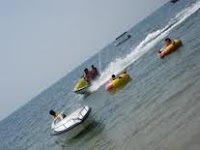 One can enjoy a lot of water sports at the Caranzalem beach as it has a lot of water scooters and other water sport facilities. There are also a number of hotels and restaurants in the area that serve some tasty Goan dishes and drinks. While at Caranzalem beach one can visit the surrounding beaches such as the Dona Paula beach, the Vainguinim beach and the Miramar beach. One can also enjoy sightseeing of the nearby attractions such as the Cabo Raj Bhavan, the British cemetery, the Goa Science Museum and the St Inez cemetery. Caranzalem beach is well connected with the neighbouring areas and can be easily reached. For accommodation also one will find quite a few reasonable hotels, guest houses and apartments for rent in the Village.